I’ve been reading the Bible for about 40 years now. I’ve been studying it professionally for about 20 of those. Yet I’m still discovering new aspects and different dimensions to this incredible book on an almost daily basis. One new insight that occurred to me recently was in the account of the paralysed man brought to Jesus by four friends. In particular it was Jesus’ response to the four men that struck me. This is a real “Blokes’” story. There is a certain gung-ho, never-say-die, can-do attitude expressed by these men. They were going to bring their friend to Jesus, no matter what. When polite coughing and “excuse me’s” failed to get them access to the room in which Jesus was teaching, they tried elbowing their way in. When that failed they just came up with a plan B – tear a hole in the roof – real bloke-y genius! The idea of politely waiting outside, just standing in line until Jesus had finished, never even occurred to them! They were men of action, impatient and somewhat reckless and no one dared stop them – they were on a mission! Yet, the thing that most struck me in this story, something I had never noticed before was in the following verse. The faith that brings help and healing to this poor, suffering, paralysed man is not his own but his friends’. It is their faith, on his behalf, that releases Jesus’ healing power into the man’s situation. The implications of this, for the Christian life and for Christian mission are massive. By our prayers we can stand before God on behalf of those who cannot, will not or do not know how to pray for themselves. In some mysterious way, we can by our faith, make up for the lack of faith in our friends. We see several miracles in the life of Jesus that seem to fall into this category. 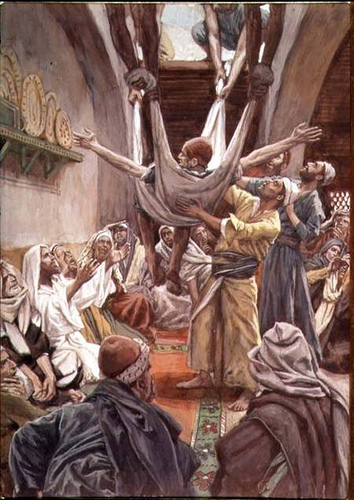 When Jesus responds to someone’s faith by healing a third party – the Centurion and his servant (Matthew 8:5-13), Jairus and his daughter (Mark 5:21-43), even the resurrections of Lazarus and the Widow of Nain’s son must also fall into this category for a dead person obviously cannot have faith for himself! It struck me that this reality about faith also has significant implications for the communal dimension of Christian discipleship. For all of us will go through times, periods, situations when our own faith fails. At these times we can be carried along and supported by the faith of our Christian brothers and sisters. When we are struggling – when we are being tempted to the limit of our strength, in danger of falling – the faith of our families and friends can uphold us, sustain us and keep us on track. It seemed that Job worried that in the full swing of ‘rich kids, having fun’, things might get out of hand. His children’s standards of behaviour and conversation might slip and some mistakes might be made. So Job ‘stands in the gap’ for his kids, he asks God to forgive them any sins and restore them to Himself. As I thought about this subject I was powerfully struck by the strong implications it has to nullify any spiritual pride in my life. For none of us, looking back over our lives, can know for certain that our safe passage through times of struggle and temptation was the result of our own faith in God, or merely God’s gracious response to the faith of those around us, friends who prayed for us, confessed for us, stood in the gap before God for us. We may well discover in the life to come, that many of those times when we proudly thought we had won a great victory, we were merely, like the paralysed man in the story, being carried along by our friends. This entry was posted in Faith, Jesus and the paralysed man, Job, vicarious faith and tagged Faith, jesus and the paralysed man, job, vicarious faith by fuelforpilgrims. Bookmark the permalink. I’ve sent on an extract to the ecumenical prayer team I’m building here, supporting work amongst young people. Attributed to you of course, and with a link to the page. Thanks! Thanks Gill. Appreciate that. Fuel for Pilgrims Volume 1 is fast approaching publication. “40 daily meditations to fuel your pilgrimage”. Maybe you could publicise that too when it comes out? !